A healthy breakfast is colloquially speaking, "the king of all meals" and should not be skipped. Yet we often break this unwritten rule. If we find time to have a bite to eat in the morning, we usually to do quickly or choose a completely wrong combination, and then we wonder why we are tired every day, have no energy and are overweight, which we cannot explain because we eat only twice a day? Perhaps the answer lies in the breakfast and the mistakes that we make in connection with it! Skipping breakfast is certainly the most common mistake that we do today and we justify it by the lack of time. However, time for a coffee and cigarette we almost always have in the morning. The consequences of this practice are multiple, and abdominal obesity and weight gain is only one of them. Surely you have noticed that after skipping breakfast you are so hungry that for lunch and dinner you do not know how to make up for all the calories, so you eat twice as much as what you eat normally. As scientists have proved, after skipping breakfast, the brain begins to send you information that you need a stronger calorie foods. Another consequence of skipping breakfast is the lack of energy because you have not entered the fuel in the body. Also, studies have shown that people who skip breakfast regularly have a higher risk of cardiovascular disease and high levels of bad cholesterol in the blood. If your excuse is that you have to work early, so you have no time to eat, you can relax and eat a healthy breakfast at work, the best until nine o’clock. In fact, some experts point out that the best breakfast time is three hours after awakening, because the body needs so much time for natural detoxification, and it is not recommended to disturb that. Still, immediately after waking up, eat at least a teaspoon of a quality honey with a glass of water and eat fruits, and eat a healthy breakfast at the job. See our article honey water. Surely at least once you have been forced to eat breakfast this way. However eating like this is almost as bad as skipping breakfast entirely. In this way, instead of any good ideas for a healthy breakfast, we do not think much about the consequences and usually eat an energy bar of chocolate, a roll of white flour, two or three bites of bread and coffee, rolls of puff pastry or several industrial cookies, which will make us feel full, but after a short time again we feel very hungry. We do not have time to eat properly, or to come up with a quality healthy breakfast we will take the bar or two of chocolate, that will actually raise blood sugar, but the sugar will plummet, and hunger and fatigue will be there again. So, if we did not enter anything in the body of the necessary fuel, but a bunch of unnecessary calories, it will convert into fat and affect weight gain. Eating, “on feet " is a very bad habit, because in this case the food is not chewed enough, but it is literally swallowed, which negatively affects the digestive system and leads to digestive problems, in a long-term can cause constipation and even the appearance of haemorrhoids, but also all this leads to the deposition of fat and undermines our health. This is a very big mistake, because many do not understand and identify that a healthy breakfast is also the strongest meal during the day, but mistakenly think it must contain fatty foods and foods difficult to digest. People who have this kind of belief usually have incompatible combinations for breakfast - fried eggs with bacon, cheese, yogurt and bread, white flour, or meat pie and yogurt or pizza, and sometimes on the way to work we stop for a burger and take a greasy burger. To put it mildly this combination is incompatible and wrong for several reasons. First, you enter into the body too much calories, and this breakfast has too much harmful saturated fats, which we are very fattening and have a negative impact on health. This is certainly not a healthy breakfast for weight loss but for chronic weight gain. Also, after this meal you will feel very sluggish, because we spend all our energy on digestion, which it will not be enough to perform other daily activities. In addition, there are violated rules of combining ingredients in the context of a meal, which to our stomach represents an impossible mission, and this is always one of the reasons of weight gain. A big mistake and delusion which a lot of us face every morning is that sometimes in the desire for healthier foods we resort to purchasing packaged mixtures of cereals, the pictures really seem appealing, but such is their taste. They quickly save us only a few minutes, boil 2 dl of water, pour the contents of the bag and wait for five to six minutes after that we can eat. If you pay attention to the declaration, you will see that this oatmeal usually contains sugar, artificial sweeteners and candied (candied) fruit. All of this is added to cereal meals to make it tastier and more acceptable to consumers. Even plain cornflakes, of which we make corn bread, polenta (corn meal) CESE contain sugar. This meal is quite caloric in comparison to what you can prepare yourself. 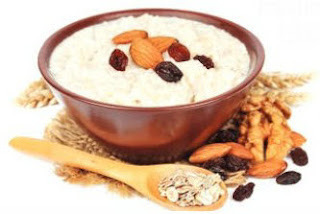 Here is a great idea for a healthy breakfast: buy an oatmeal, barley, rye flakes or other and add the hazelnuts, almonds, walnuts, and dried fruit and make your own blend, which you will sweeten with homemade honey or stevia. Eat this every morning, this is a real healthy breakfast for athletes, children, and the elderly and even pregnant women. FRUIT FOR BREAKFAST – IS IT HEALTHY? Often on the Internet we can see that the menus on the list of foods for a healthy breakfast have, for example, bread, cheese, yogurt, ham and some fruit with all of them combined. Fruit really needs to be consumed in the morning, but for many people because of these menus or personal appetite make a big mistake, and eat it with a meal or shortly thereafter. Why is this wrong? One should know that the fruit is not digested in the stomach, but in the small intestine, it just needs to pass (slides) through the stomach. However, this is impossible if the stomach is full of other (strong and caloric) foods, which means that the fruit eaten with a meal or after a meal only hinders good digestion. And then it comes to the fermentation, which creates toxins and negative impact on our health and weight. Thus, the fruit for breakfast can be eaten but not in this way, as will bring us a lot more harm than good. When you need to eat? It is best to do it immediately after waking up, while our stomach is empty or four hours after a meal, or a minimum of half an hour before the next meal. Only after such a meal we can say that it is truly a healthy breakfast and that will give us the necessary energy for the whole day, otherwise it will kill us and slow down. Mix two cups of whole wheat flour from spelt, a teaspoon of salt, a little baking soda and three tablespoons of flax and sesame seeds, half a cup of sunflower seeds, a tablespoon of cumin, a decilitre of cold pressed sunflower oil and enough water until the mixture connects. Roll the dough with a rolling pin and then with a glass removing circles, put them in the pan on a baking sheet and bake at 200 degrees for about 15 minutes. Two tablespoons of linseed, sesame, pumpkin and sunflower seeds mix with a teaspoon of olive oil, a spoon of tomato juice and a little mustard or curry spices. Rub it on the bread and put the lettuce leaves and arugula on it. These recipes are a great choice and also can be a healthy breakfast for children, which should be introduced to these healthy habits. The most important thing is to avoid the mornings processed meats (salami, hot dogs and the like.) And combining them with yogurt, milk and others. Find out which are still healthy whole grains for the best breakfast.